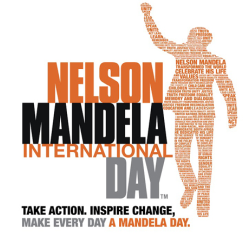 Celebrate Mandela Day at the Nelson Mandela Metropolitan Art Museum by being part of a living artwork. We are inviting the community of Nelson Mandela Bay to collaborate on a collectively made yarn sculpture. All you need to participate is come to the museum on 17 July 2015 between 9:00 and 17:00 or on 18 of July 2015 between 13:00 and 17:00. All the necessary materials will be provided. Nelson Mandela followed three rules throughout his life: Free yourself, free others and serve every day. The Art Museum would like participants to think about how Mandela inspires them while adding their strand of yarn to the living artwork and to write a message on a piece of paper to be added to the interactive sculpture. Textiles have the ability to absorb, enfold, contain, expand, and link together. The medium of textile therefore lends itself to metaphors that describe the connections between us, our societies and even our place in the universe. So come to the Art Museum and be ‘interwoven’ into the ‘social fabric’ of a living art work and in the process take a moment to reflect through the interconnected ‘web’ of yarn all the ‘threads’ that bind us together as a country. The collaborative yarn sculpture corresponds with the exhibition, Fabric Of Existence, which will be on view until 19 June 2015. From delicate embroidered scenes on Chinese textiles to tapestries of Zulu warriors, beaded Southern Nguni garments with coded messages and a large pot made out of animal hide, each work tells its own story through the medium of textile. The Art Museum’s Mandela Day Yarn Sculpture will be posted on the Nelson Mandela Metropolitan Art Museum’s Facebook page. The work will be up until 22 July 2015.